Trial • Microsoft CEO says the software Novell acquired wasnever envisioned for word processors and spreadsheets. 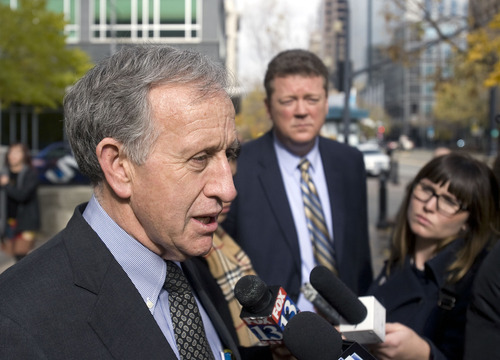 Al Hartmann | The Salt Lake Tribune Jim Jardine, counselor for Bill Gates and Microsoft speaks to media Monday Novermber 21 outside the federal court in Salt Lake City after the first morning's testimony in the Novell-Microsoft lawsuit. Microsoft co-founder and chairman Bill Gates leaves the Frank E. Moss federal courthouse in Salt Lake City, Monday, Nov. 21, 2011. Gates testified in a $1 billion antitrust lawsuit brought by Novell Inc. (AP Photo/Jim Urquhart) Al Hartmann | The Salt Lake Tribune Bill Gates, right, is escorted by John Pinette from federal court in Salt Lake City on Monda, Nov. 21 after the first day testimony in a lawsuit pitting Novell against Microsoft. 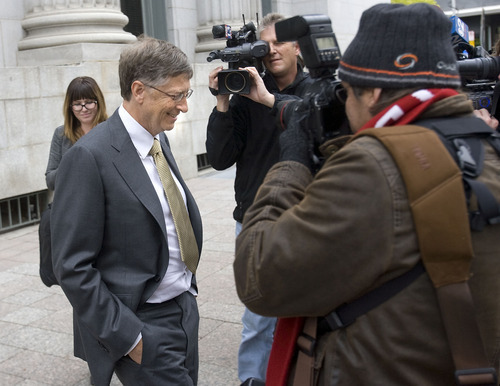 Al Hartmann | The Salt Lake Tribune Bill Gates leaves federal court in Salt Lake City on Monday, Nov. 21 after the first day testimony in a lawsuit pitting Novell against Microsoft. 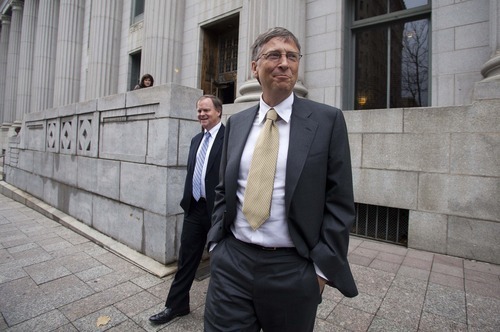 Microsoft founder Bill Gates arrives at the Frank E. Moss federal courthouse in Salt Lake City, Monday, Nov. 21, 2011. Gates was scheduled to testify in a one billion dollar antitrust lawsuit brought by Novell Inc. Gates, wearing a gray suit and a yellow tie, was the first witness to testify as Microsoft lawyers presented their case in the trial that's been ongoing in federal court in Salt Lake City for about a month. 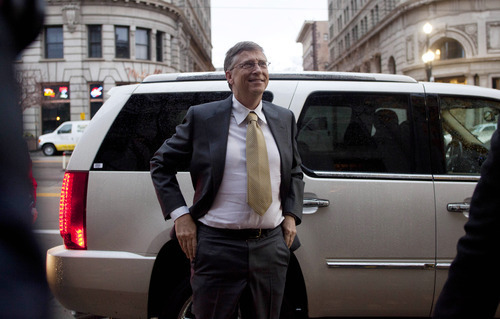 (AP Photo/Jim Urquhart) Al Hartmann | The Salt Lake Tribune Bill Gates leaves federal court in Salt Lake City on Monday, Nov. 21 after the first day testimony in the lawsuit pitting Novell against Microsoft. 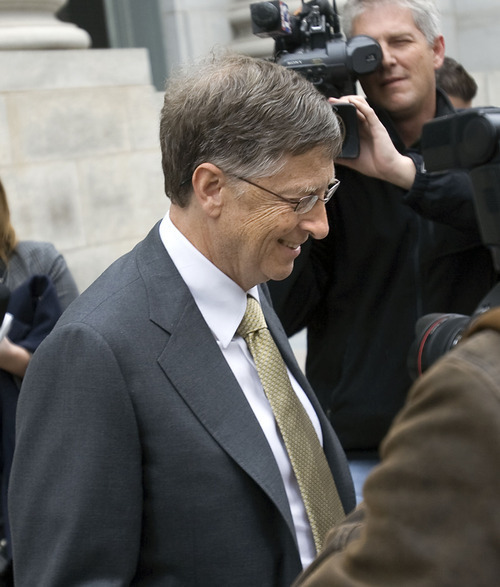 Microsoft Chairman Bill Gates took the stand in federal court in Salt Lake City Tuesday morning for a second day in an anti-trust trial in which a billion dollars is at stake. Gates is facing cross-examination by attorneys for Novell, the Utah-based software company that contends Microsoft and its then-CEO engaged in an effort in 1994 to damage Novell and its products. On Monday, alternately calm and combative, Gates testified that a decision he made 17 years ago was not intended to help his company's software programs catch up to fledgling competitor Novell. The latter's lawsuit alleges he engaged in anti-competitive behavior related to Windows 95 that caused the Provo company to lose about $1 billion in value. Gates was comfortable and talkative on the witness stand Monday under questioning by Microsoft attorney Steve Holley. But when Novell's lead trial attorney, Jeffrey Johnson, started his cross-examination, the pitch of Gates' voice rose slightly and he become contentious, more terse and occasionally combative before an almost full courtroom. 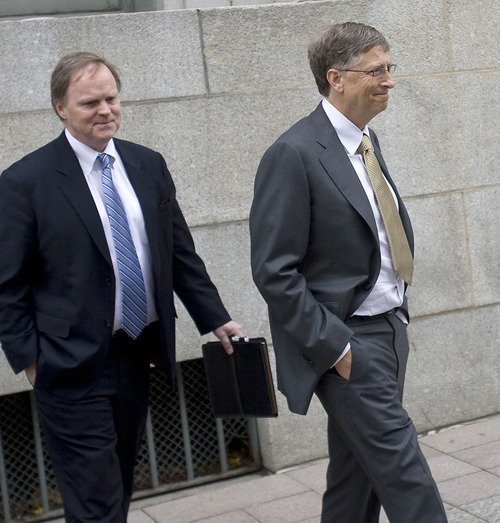 Gates was the opening defense witness Monday for Microsoft after Novell completed its case last week. Novell claims in its lawsuit filed in 2004 that its ill-fated 1994 purchase of WordPerfect and the spreadsheet Quattro Pro were undermined when Gates decided to withdraw support for a software code feature that the software giant had previously enthusiastically promoted for Windows 95. But Gates testified that in making the decision about the code, he was concerned not about Novell but about one element of the program that could have caused computers to crash. That code, technically known as "name space extensions," had to do with the display of folders and files. In fact, Gates testified, the name space extensions were never envisioned for use by word processors and spreadsheets such as those Novell had acquired when it bought WordPerfect and Quattro Pro. "The name space extensions are pretty irrelevant when it comes to word processing and spreadsheets," he told the jury, which was largely attentive throughout his Monday testimony. Novell says an Oct. 3, 1994, email from Gates to Microsoft developers shows him violating antitrust laws. But Gates said Monday the email was "absolutely not" intended to show he was targeting WordPerfect and that the code in question was "absolutely not" crucial to developing Windows 95 versions of WordPerfect and Quattro Pro. Windows 95 proved a huge success when it was launched in August 1995. Novell says its ability to bring out updated versions of WordPerfect and Quattro Pro that took advantage of its new features was crippled by Gates' decision. But Gates testified that Novell had a number of options to integrate its products into Windows 95, and he blamed WordPerfect and Novell for failing to recognize soon enough that the graphic interface used in the new operating system would become the norm that consumers would quickly adopt. A leading computer magazine had given Microsoft's Word its highest marks for usability, while downgrading WordPerfect, the former top word processor, Gates said. In addition, WordPerfect before the Novell purchase had dropped its policy of unlimited telephone support for customers, doing away with one of the keys to its success. Gates said. "We viewed it as likely to cause a lot of people to take a look at another word processor," he said. His testimony was consistent with the view of Microsoft's legal team, that bad decisions and missteps by WordPerfect and Novell led to WordPerfect plunge from the world's favorite spreadsheet to a tiny market share. Judge J. Frederick Motz on Monday denied a Microsoft motion to end the case at the halfway point.